The majority of my on-the-job training is as a graphic designer. I started by pirating a copy of Photoshop in high school so that I could color my own comics. Now I proudly suckle at the $50/mo. Adobe CS teet. But if you’re just starting out in rpg design, and you want to self publish, it doesn’t have to be that way. First, get the idea out of your head that a polished InDesigned/Photoshopped/Illustatored is what’s keeping your great idea from getting out there. Most of the AAA published titles don’t look that great considering their budget, team, artists, and parchment texture. I think you can do more with less. In fact, let’s see what you can get away with by using only plain text. Plain text is great — I’m using it to write this blog post right now in TextEdit, the native plain text writing app. If you’re using Windows, you probably want Notepad. The great thing about plain text is its not distracting. I’m a graphic designer, so I’m constantly distracted by formatting and layout, which keeps me from focusing on content. So I started writing all of my books in markdown before importing it (either through blot for my blog, or using this awesome script to get it into InDesign). I won’t go too far down the rabbit hole of plain text editors, markdown, etc. right now. But I’ll just say, I’ve found a lot of use out of writing things in this stripped down style. But how does this apply to you, the budding rpg writer / publisher who has no idea how to get started in layout? Let’s start with some of the awesome examples of things you can do. 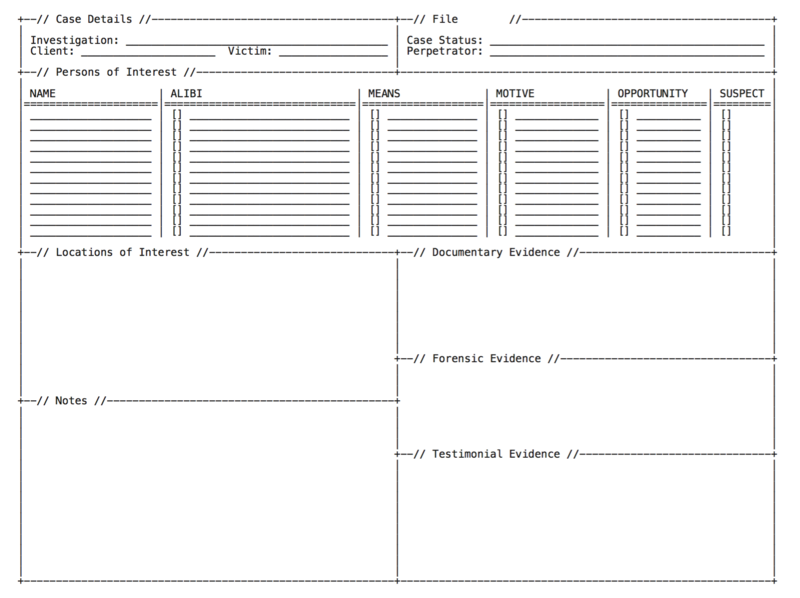 You might be agreeing with me that you don’t need fancy layout software to write a book, maybe you can just do that in Microsoft Word (you can), but what about complicated stuff, like character sheets? Here’s a character sheet I built for my investigation game, which uses the same chassis as Heist. This thing is full page, prints out great, has plenty of room for everything you need and kinda looks cool. It’s got a built in low-fi aesthetic. And this is a pretty cramped character sheet too. It’s got a lot going on. It took me about an hour to do (plain text isn’t faster, I’ll grant you that for sure), but man I kinda love it. 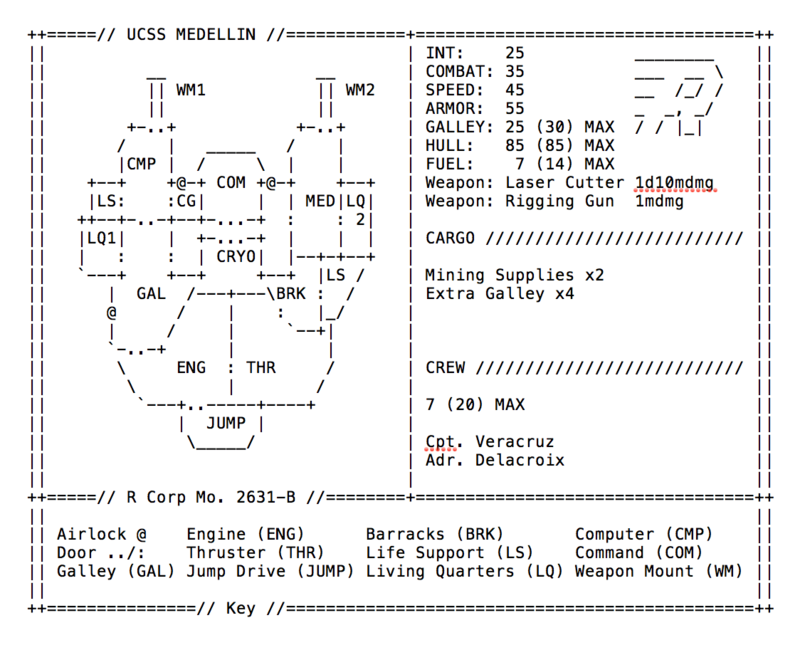 You’ve probably seen this before but here it is in plain text form: my investigation sheet. This one is fun because, again, it feels thematic. It’s got that typewriter written feel to it, which is very much inline with a regular police force’s files. Again, none of this is ground breaking — I put the information into a text editor, used a couple of vertical bars, dashes, and underscores, and boom its done. 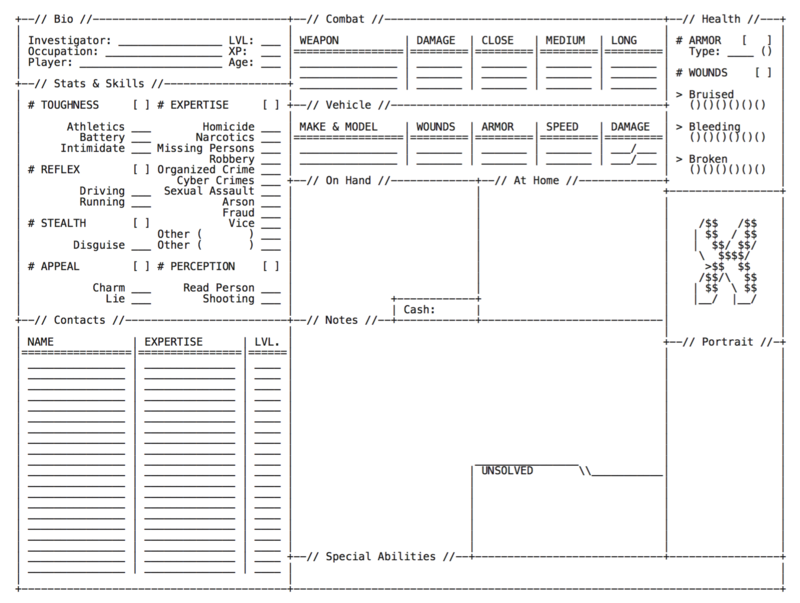 The most important thing in an RPG is that your tools are useful, not pretty. If you make enough useful tools, people will eventually hire you and pay you to make prettier versions. Okay, so character sheets and other paperwork make sense, because after all, this is how they were made originally, right? Someone had to type out the form for you to fill out after copies were made. But what about something more complicated, like maps? 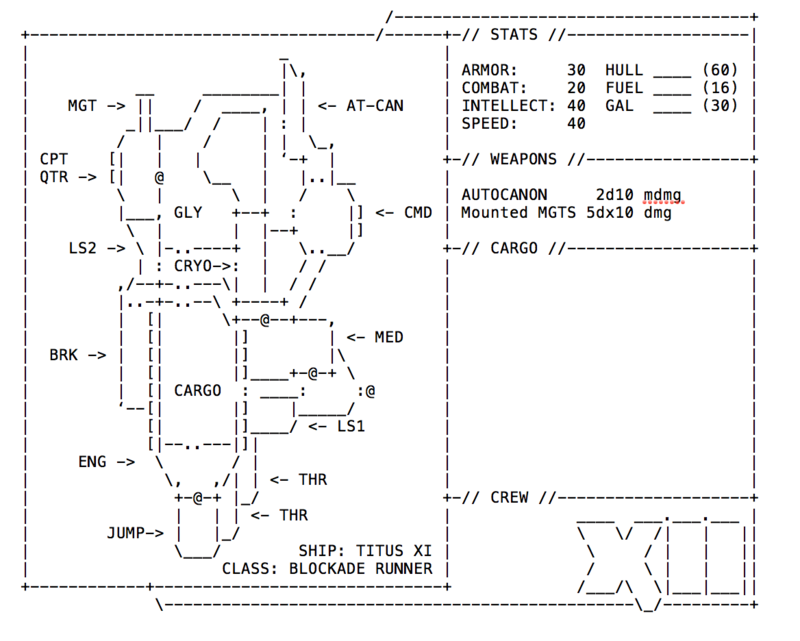 Here’s a couple of deckplans I put together for Mothership. They each took about 30 minutes, are totally tonally consistent, and actually look like something you could hand to your players. Again, nothing fancy. If you put together a book of d100 of these, even if they were built according to the rules-as-written, I’m fairly certain you could sell a decent chunk of these on DriveThruRPG - just so that Wardens didn’t have to spend time making their own ships. Weirdly, this also works for D&D and fantasy games, since the plaintext aesthetic feels like a throwback to nethack, rogue, and some of the first real video game incarnations of D&D. Now here’s one that I didn’t do, but I thought it was so gorgeous it’s what set me off down this rabbit trail. 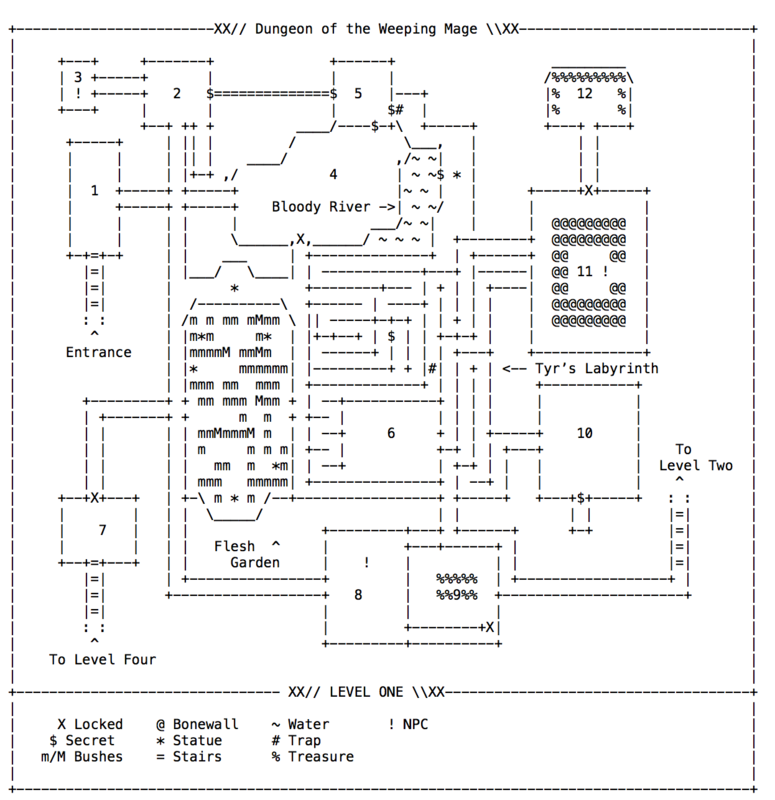 The original is a player’s map for an OD&d sandbox campaign. The keying looks pretty extensive, but this weirdly makes me so curious as to what each symbol stands for. 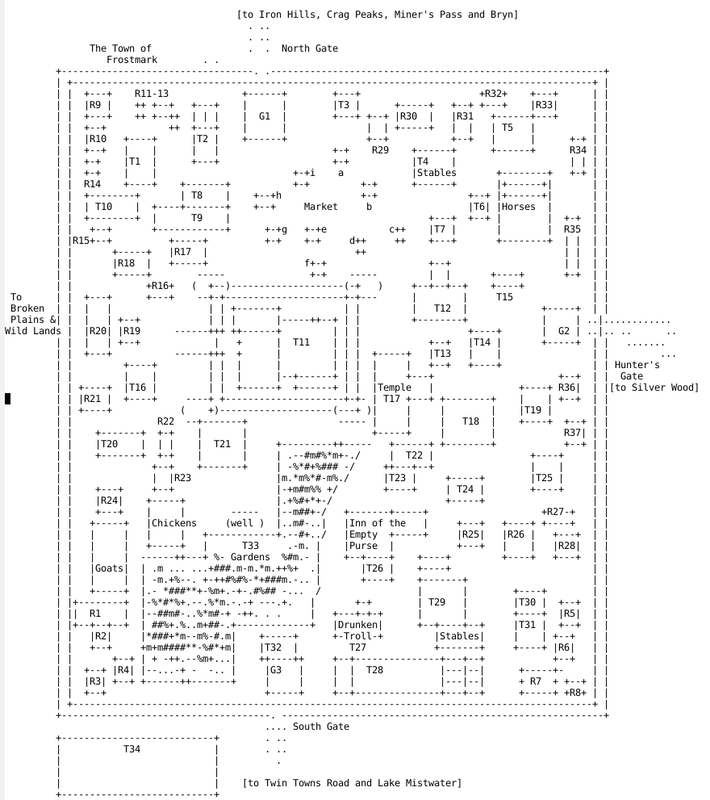 Personally, I’ll take this over a lush faux-watercolor 5e map any day. You could write a whole module in plaintext and print it out zine style or just sell the PDF as soon as you’re done. These things aren’t hindrances. Now, you can do a lot with just Microsoft Word and you can learn Scribus and Gimp if you want also. Don’t know anything about typography? Here’s an amazing, free guide that teaches you how to create clean looking typography and conveniently tells you how to do it in Microsoft Word as well. Will you eventually need to learn InDesign or Illustrator or how to paint? Maybe. But right now, it is 100% not the thing that is holding you back from writing or laying out your awesome module. Make something kickass and only do it in plaintext? Graphic designers and artists will approach you to work with you. Don’t let software be an excuse, because in the end, software won’t save you. Want to subscribe for monthly updates? Enter your e-mail below!